The D chords are also important guitar chords to learn, and are pretty easy to learn. D major in the open position is played on the upper four strings (D, G, B and e). They’re the "upper" strings because we’re moving up higher in the note scales as we go up the strings. The D string (fourth) will be played open. On the third string (G), press your index finger at the second fret. Your middle finger goes on the first string (e) at the second fret. On the second string (B), press your ring finger at the third fret. Give it a strum. You’ll find a lot of songs that use the D chord as a base and then add a G note on the first string (e) with the pinky at the third fret. You can hear an example of this in the intro of Rush’s "Fly By Night". You hear the D chord strummed twice and then Alex Lifeson adds the G note for the next two strums. 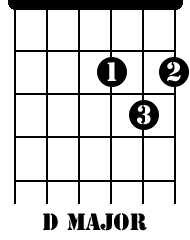 D major as a barre chord is just like the barred C major, just up the neck a full step (two frets) to the fifth fret. Barre strings one through five with your index finger, then bar the B, G and D strings (2, 3 and 4) with your ring finger at the seventh fret. If you really want to get crazy with guitar chords to learn, you can also play D up the neck and barred at the tenth fret. Of course, use your index finger for the barre, all six strings. Your middle finger is pressed on string 3 (G) on the eleventh fret. On the twelfth fret, press your ring finger on the fifth string (A) and your pinky finger on the fourth string (D). Dm in the open position is formed by pressing your index finger at the first fret on the first string (high e). Your middle finger goes on string 3 (G) at the second fret. Lastly, your ring finger gets pressed on the second string (B) at the third fret. Like D major, when you strum the chord, play the fourth string open (D). There you have it. The barred Dm chord is again at the fifth fret. Strings 1 through 5 are barred with the index finger and your middle finger presses at fret 6 on the second string (B). Meanwhile, your ring and pinky fingers press the fourth and third strings (D and G) at the seventh fret. Are you getting the hang of this? Excellent! You can play the Dm chord two different ways at the tenth fret. The first is a super easy version of the Dm guitar chords to learn. Just barre the first three strings (G, B and e). Play the chord with the fourth string (D) open. That’s it! Lastly, the Dm in the barred position at the tenth fret. Just press your index across all six strings. On the twelfth fret, press your ring finger on the fifth string (A) and your pinky finger on the fourth string (D).